Relax and reconnect with your sweetheart while enjoying breathtaking Oahu! Indulge in our “Oahu Is for Lovers” Couples Jeep Tour, and spend the day at one romantic venue after the next! Perfect for couples who want to unwind, connect and enjoy the serenity of Oahu. You'll hop into one of our open air jeeps, drop the top, soak up the sun and enjoy! You'll also have a local Hawaiian guide to take care of you during you entire day. Your day starts with a convenient pick-up at your hotel, and then we’re off on our adventure! As you and your beloved relax in your very own Jeep, we’ll take you on a scenic drive along the island’s famous Ka Iwi coastline in East Oahu, where lush, jagged sea cliffs meet coves and beaches down below. Along the way, we’ll stop and explore some of Oahu’s most beautiful lookouts, so you can absorb the area’s majestic views. Enjoy the refreshing sea spray near Halona Blowhole, as you watch a giant “geyser” of water explode into the sky. And experience peaceful Makapuu Point Lookout, with unparalleled views of the sea cliffs, Makapuu Beach, and Rabbit Island. Or wind your way down to the area’s extraordinary tide pools, where you can wade through shallow water, explore the ocean wildlife, and climb on lava rock. If you’re visiting during the winter, make sure you watch for whales at the Halona Blowhole and Makapuu Point Lookout, as they often put on a show at both of these amazing venues. Then, let us spoil you and your beloved with a delicious picnic lunch on the sand, followed by a day of frolicking at a secluded beach with the works: beach chairs, umbrella, and a cooler with Hawaiian refreshments and goodies! Relax in the sand or tap-into your inner-child while playing in the waves. It’s your tour and your choice! We’ll take care of the details – just sit back, relax, and enjoy your company! 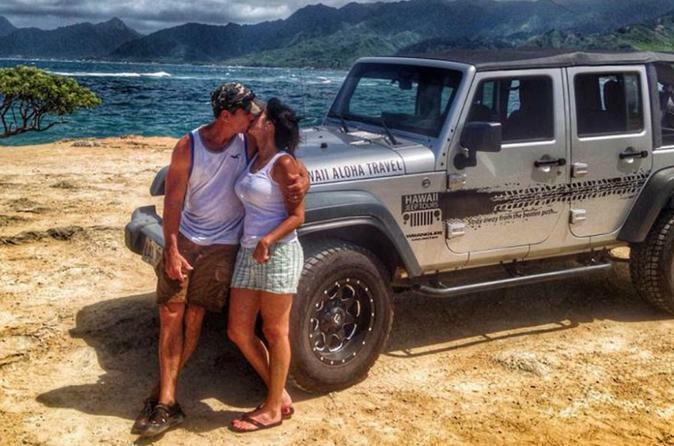 Book an “Oahu Is for Lovers” Couples Jeep Tour, and romance your sweetheart Hawaiian-style!